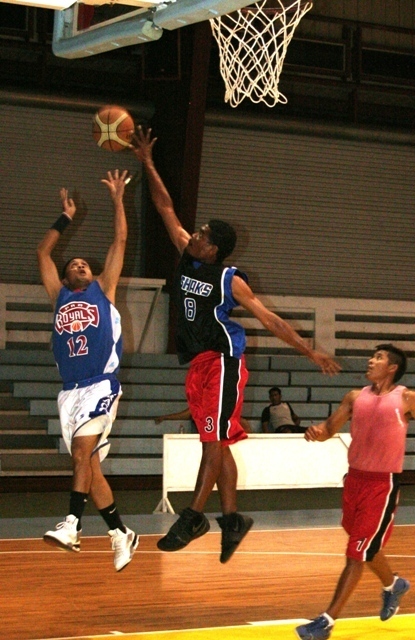 Team Sam’s Sharks used its fourth quarter assault to tame the Palau Royal Resort (PRR) Dragons, 88-67 Wednesday night in the ongoing 2013 season of the Rudimch Enterprise Government/Business League at the Palau National gym. 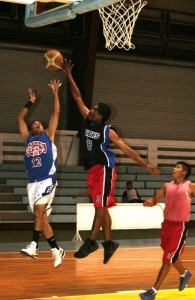 Sam’ Sharks were in control of the game since the tip off as they head to the fourth canto with a 62-55 advantage. They were able to secure the win as they scored a 26-12 to maintain their lead and score the win. Wade Rdechor and Armando Canseco topscored for Sam’s Sharks with identical 21 points while Masao Umedip led the Dragons with 16 as Roger Santos, Josh and Gener Aguinaldo chipped in identical 11 markers, respectively on the losing cause. In other games, team ABC won over MOE Spiders, 20-0; Mason’s Hardware defeated PPR Stingrays, 85-73; KSG Royals beat MOH Band Aid, 93-47; PPR Shark Attack outscored Neco, 92-76; President’s X-Men escaped Island Rhythm, 73-68; and MOF Omsangel won over MOE Spiders, 20-0. Games resume tonight with WCTC versus Neco at 7:30p.m. while Galaxy Builders will meet Fish n’ Fins at 9 p.m. Monday night games will have MOF Omsangel against PPUC Electric Eel at 7:30 p.m. as RTRMI Crushers will face Mason’s Hardware at 9 p.m.